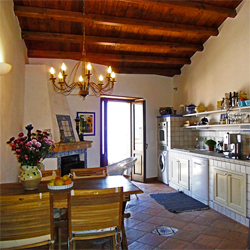 Looking for a Holiday Cottage in Sicily? Possibly in a village largely unspoilt by mass tourism? But yet not totally off the beaten track? And, of course, not far from the sea? Perhaps even with a view? Pleasantly furnished, and fully equipped? Well, you're not exactly demanding, are you...? ★★★★★ on ► TripAdvisor and ► HomeAway. Holiday Cottage CASA LA ZAGARA in Forza d'Agrò, Sicily: Carefully refurbished & fully equipped Holiday Cottage, in picturesque village high above the coastline. 5kms to beach. Elevation 420m a.s.l.